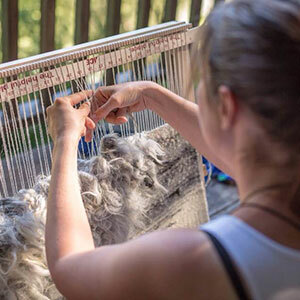 Meghan Bogden Shimek is a weaver and fiber artist living in the San Francisco Bay Area. Meghan is inspired by nature and prefers to use local fibers whenever they are available. She integrates traditional tapestry and Navajo weaving techniques with raw fibers and objects. Her work can be seen at natievtextile.com.